Judith Green was born in London. She now lives and works in Cornwall. Her artistic education includes a BA (Hons) in Graphic Design from Kingston School of Art and studied painting at The Slade School of Art. Following a successful career as an Art Director, in 1984 she co-founded the international award winning design consultancy,The Green House. In 2000 Judith made the decision to relinquish her full-time design career to focus on painting and in 2001 Judith was awarded a place on the Drawing Year MA level program at the Royal Drawing School. She later went on to complete a Founder's portrait of Mr J Whittaker CBE for the school in 2008, which is now in HRH The Prince of Wales' private collection. 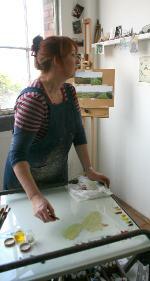 In 2009 Judith was selected for the Artists' Residency at Kensington Palace. She has exhibited work in exhibitions at the Medici Gallery ( Cork Street ) London, The Threadneedle Prize, shortlisted for The John Moore's 26 & 24, and has twice been selected by The Royal Society of Portrait Painters, The Discerning Eye, and for a fourth year at The Royal Academy of Arts. She has work in numerous private collections in the UK, USA and Middle East.